This was the first time that Relaxed Muscle songs were played. However, this wasn't a Relaxed Muscle gig. 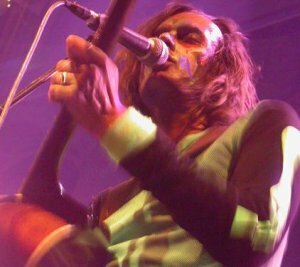 Jarvis and Richard Hawley appeared under their own names supporting Lee Hazlewood and played the three songs that later appeared on the The Heavy EP, plus some other stuff, including a cover of Hazlewood's A Cheat. It's not clear whether Relaxed Muscle was even planned at this point: it may have been regarded as just a one-off bit of fun. Relaxed Muscle appeared as part of a special event titled "Who's Zoo?" created by British choreographer Michael Clark. The event featured music accompanied by dancers - both professionals and untrained volunteers - plus, special lighting and projections. The New York Times reviewed the first night and reported that Relaxed Muscle played four of the show’s six songs with The Heavy, Let It Ride, Beastmaster and an encore of B-Real. Pulp's F.E.E.L.I.N.G.C.A.L.L.E.D.L.O.V.E. was also featured, although not played live.